The Environmental Compliance Division at the Coast Guard base where I work is tasked with cleaning up decades worth of environmental problem areas on base and instituting sustainable operating procedures in the way the Coast Guard serves America. According to ARSC’s newsletter, we “recycled (kept out of landfills) 1330 pounds of toner cartridges in 2007” and kept 1005 pounds of alkaline batteries from landfills by recycling, five times the amount of batteries recycled in 20061. To clean up past bad practices, the ECD has started planting trees in contaminated areas, which draw pollutants out of the ground and prevent them from contaminating the water table. The fans on short poles visible amid the trees in these photos are drawing petroleum hydrocarbons out of the soil and atomizing them into the air. From 1941 until 1991, the surrounding area was used as a fuel farm for aircraft refueling. The fuel farm consisted of multiple underground and above-ground storage tanks which were decommissioned and removed from the site. Evidence of a release was observed during the tank removal activities, resulting in impacts on subsurface soils and groundwater by petroleum hydrocarbons. 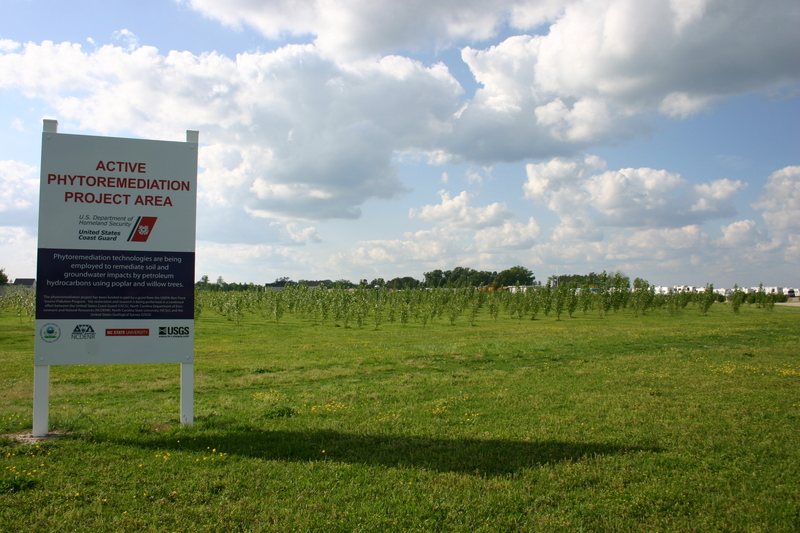 Phytoremediation was the selected remedy to control and contain contaminated groundwater migration and to remediate impacted soil and groundwater. Phytoremediation is an innovative and cost-effective technology that refers to the use of plant-based systems to remove, degrade, or stabilize environmental contaminants present in soil and/or groundwater. Both poplar and willow trees have been planted across the site to remediate subsurface soils and groundwater. 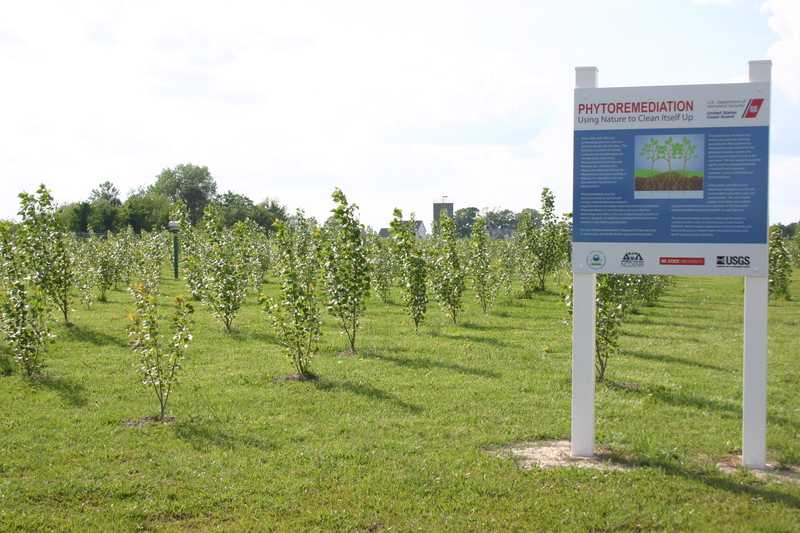 The use of both poplar and willow trees within a phytoremediation plot can capitalize on the favorable phytoremediation potential specific to each species. The phytoremediation project is being performed in a combined effort with the United States Coast Guard, ARCADIS, North Carolina Department of Environment and Natural Resources, United States Geological Survey, and North Carolina State University. 1“ARSC Environmental Goals,” The Flyer Volume 1, Issue 2, Feburary 2008. Poplars and willows are perfect for this application. Plants Rule!! I am using cites like this in my oceanography and botany classes.